Toque & Canoe—a blog/online magazine featuring stories about Canadian travel culture—was founded by Jen Twyman (Toque) and Kim Gray (Canoe). Two Canadian travellers with journalism backgrounds, Twyman and Gray previously collaborated on stories for mainstream media about their adventures. Driven by a desire to reinvigorate what coverage of Canada’s travel scene could look like, they created Toque & Canoe as their own storytelling vehicle and launched it, fittingly, on Canada Day in 2011. A fresh and distinct voice in the world of Canadian travel media was born — a voice with a strong online presence on multiple platforms that connects with a growing and engaged audience. — Our little blog that could became a nationally award-winning site in 2012 when it was named “Best Travel Blog/Canadian & International Submissions,” courtesy Destination Canada GoMedia Awards judge Ryan Holmes of Hootsuite fame. 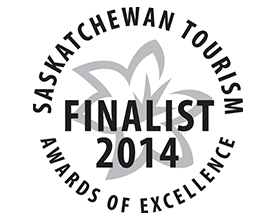 We were also, in 2012, nominated for a White Hat Award by Tourism Calgary. — In 2013, Toque & Canoe won Online Magazine of the Year at the Western Magazine Awards in Vancouver. — In 2014, contributors Lorna Crozier (a Governor General award-winning Canadian poet) and photographer Lori Andrews were listed as finalists in Tourism Saskatchewan’s Awards of Excellence for their collaboration Exploring Light’s Birthplace. — In 2015, our post Tasting Turtle Island: Aboriginal Cuisine Goes Mainstream was shortlisted in the culinary category for Destination Canada’s prestigious Explore Canada GoMedia Awards of Excellence. — In 2016, we were formally recognized, for work related to Toque & Canoe, by the Royal Canadian Geographical Society at their College of Fellows annual dinner in Ottawa, Ontario. — In 2018, we were invited by the Nature Conservancy of Canada to present on their popular speaking tour given that nature is often a theme in our travel coverage. We were also thrilled, in 2018, to hire ourselves out as editors for the visually stunning Churchill Wild: 25 years of Adventure on the Hudson Bay Coast — a publication that tells the story of one of Canada’s most remarkable travel companies, a company that wants to take you walking with polar bears. — You can hear us regularly on CBC Radio’s province-wide DayBreak Alberta where we share our adventures and tackle larger themes in the Canadian travel world. So, do you have any interest in travelling to Atlantic Canada and “biting into 25,000 years of caught water and frozen light?” We invite you to give celebrated poet Lorna Crozier’s Gobsmacked in Newfoundland & Labrador a read. Are you curious about the explosion of culture that is one of Western Canada’s largest Indigenous celebrations? Then you’ll definitely want to check out Pow Wow Power: The Colours of Kamloopa — an extraordinary photo essay created by prominent Calgary photojournalist Leah Hennel. Or perhaps travelling to winter-rich Winnipeg, Manitoba is more up your alley. In senior editor Valerie Berenyi’s Cold Land, Warm Heart, we encourage you to plunk yourself down on a fur-topped stump for duck confit at the world’s only pop-up restaurant pitched on a frozen river. If you, like Toque & Canoe, have a major crush on all things Canadian, follow us on Twitter, Instagram and Facebook and sign up for our (very) occasional postcard by entering your e-mail, which will remain secure, on our homepage. As we announced the day we launched in 2011, we invite you to lace up your boots and grab the bug spray. Let’s get this road trip started….